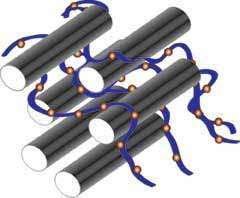 Single-walled carbon nanotubes, represented by the gray cylinders, can be combined with a catalyst (purple ribbons) that is capable of breaking down Sarin and related toxins into less dangerous components. The idea might one day be used to create clothing for increased protection against nerve agents. Nerve agents are among the world's most feared chemical weapons, but scientists at the National Institute of Standards and Technology (NIST) have demonstrated a way to engineer carbon nanotubes to dismantle the molecules of a major class of these chemicals. In principle, they say, the nanotubes could be woven into clothing that destroys the nerve agents on contact before they reach the skin. The team's experiments show that nanotubes—special molecules that resemble cylinders formed of chicken wire—can be combined with a copper-based catalyst able to break apart a key chemical bond in the class of nerve agents that includes Sarin. A small amount of catalyst can break this bond in a large number of molecules, potentially rendering a nerve agent far less harmful. Because nanotubes further enhance the breakdown capability of the catalyst and can be woven into fabric easily, the NIST team members say the findings could help protect military personnel involved in cleanup operations. Sarin—used in a 1995 Tokyo subway attack—is one of several deadly nerve agents of a group called organophosphates. Many are classified as weapons of mass destruction. While organophosphates are harmful if inhaled, they also are dangerous if absorbed through the skin, and can be even be re-released from clothing if not thoroughly decontaminated. To protect themselves during research, the team did not work with actual nerve agents, but instead used a "mimic molecule" that contains a chemical bond identical to the one found in organophosphates. Breaking this bond splits the molecule into pieces that are far less dangerous. The team developed a way to attach the catalyst molecule to the nanotubes and then tested the effectiveness of the tube-catalyst complex to break the bonds. To perform the test, the complex was deposited onto a small sheet of paper and put into a solution containing the mimic molecule. For comparison, the catalyst without nanotubes was tested simultaneously in a different solution. Then it was a simple matter of stirring and watching chemistry in action. "The solution was initially transparent, almost like water," says the team's John Heddleston, "but as soon as we added the paper, the solution started to turn yellow as the breakdown product accumulated. Measuring this color change over time told us the amount and rate of catalysis. We began to see a noticeable difference within an hour, and the longer we left it, the more yellow it became." The catalyst-nanotube complex far outperformed the catalyst alone. Principal investigator Angela Hight Walker says that several questions will need to be addressed before catalytic nanotubes start showing up in clothing, such as whether it is better to add the catalyst to the nanotubes before or after they are woven into the fabric. "We'd also like to find ways to make the catalytic reaction go faster, which is always better," Hight Walker says. "But our research group has been focusing on the fundamental science of nanoparticles for years, so we are in a good position to answer these questions." More information: M.M. Bailey, J.M. Heddleston, J. Davis, J.L. Staymates and A.R. Hight Walker. "Functionalized, carbon nanotube material for the catalytic degradation of organophosphate nerve agents." Nano Research, DOI: 10.1007/s12274-014-0405-3 , 2014, 7(3): 390–398.